A refreshed version of the Oppo Find 5 has been launched, bringing with it the Qualcomm Snapdragon 600 processor that is found in some other high-end models available now. In addition, the updated version of the phone includes Android 4.2 installed out of the box. The prior model offered a Qualcomm Snapdragon S4 Pro processor and Android 4.1.2. The rest of the specs remain the same, including 2GB of RAM, 16GB of native storage, a 13MP rear-facing camera and a 2500mAh cell. The price of the refreshed Oppo Find 5 remains the same. Meanwhile, last month the company announced that the Oppo Find 7 is under development. So far, no specs or designs have been decided on, but there is speculation that the phone will come with the Qualcomm Snapdragon 800 under the hood. 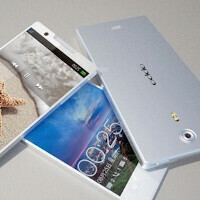 There have been conflicting reports about an Oppo Find 5 mini. Oppo recently shot down the idea after a picture of the device flanked by the full sized Oppo Find 5 was leaked. That's awesome! The phone is sold for €400 in Europe, hopefully it'll get the SD600 upgrade. Ii was Better than S3..
underrated because of no cheap plastic and no lame gimmicks..
People still playing the "cheap plastic" card? How often do you look at the back your phone? I have a case on mine, not because of the "cheap plastic" but because I want a better grip on my phone. I wish galaxy s4 looked like this.. That phone is gorgeous. Yeah i know, the white one looks amazing! too bad the final product looks different ...but it still looks beautiful tho. If they made a Google Edition, I'd buy it. From what I can tell it's not available now? Oppo's site only shows the older version with the S4 pro.